In London, the residential tower block is much maligned and doesn’t get a lot of love. These buildings are seen as shabby, dirty and blots on the skyline. And high rises are usually associated with rundown housing estates. They are dangerous, menacing and places where the urban poor live out their meagre existences. In my opinion these buildings have a bad press. They’re a source of fascination and great material for interesting architectural photographs. 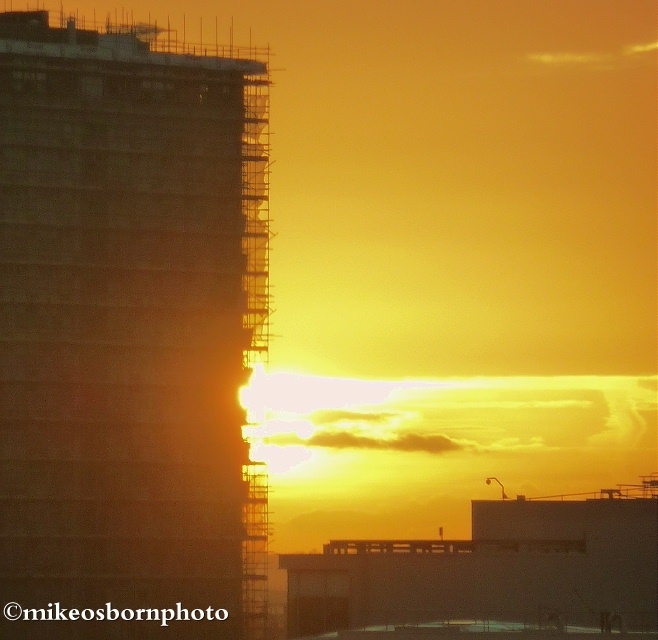 The west London tower block to the left, swathed in shabby scaffolding, brings a new synthesis to a sunrise shot. 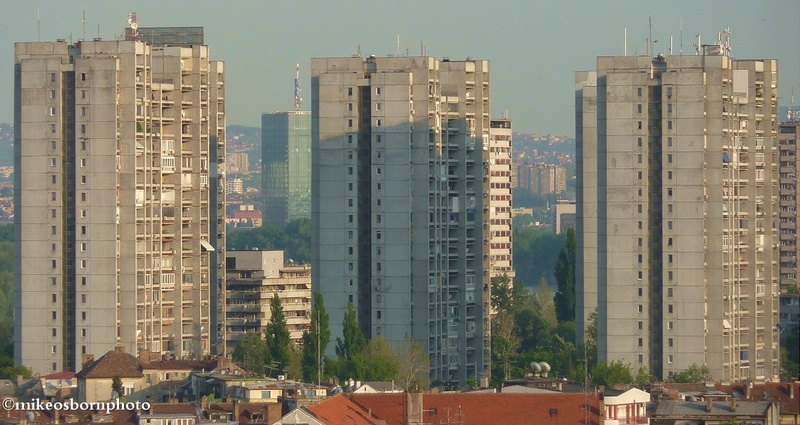 And the picture below shows a handsome trio of tower blocks in Belgrade, Serbia. They’re thriving, healthy and caught by the sun. This photo is just a taste of tower block heaven – those expansive, uniform high rise housing estates built across eastern Europe during the communist era. Does anyone have any shots of them? If not, next assignment is to visit some of those cities and create a photographic study, with great love and admiration. Excellent idea for a photo project. I couldn’t agree more. I love photographing high rise blocks. Thanks James. Plenty of them in south London to start with! I find it very curious and remarkable that you talk about these buildings with such warmth. The thing is that I grew up among them – I was born in a tiny town near Moscow. So it used to be my pain as a photographer to be living surrounded by those blocks. It’s truly inspiring and it does make me think and smile a lot when I see your attitude to such buildings. Thank you for your comment, Alexandra. Yes, I guess they can be inconvenient when trying to photograph things around them – they tend to hog the skyline! My love comes from staying on a housing estate in Bulgaria and having the view of Mount Vitosha in the distance from the balcony. But maybe this wasn’t forever and was just a romantic notion. It stuck with me, though! Not sure I share your admiration of soviet built tower blocks. my sister lived in one for a few years in Latvia. in the winter you had to wait for the temperature to drop for several days in a row before the heating came on – in all the flats at the same time. The water pipes were concreted in to the building so any leaks required major work to fix. They did however have beautiful floors and have lived in Latvia for nearly 20 years! Thanks for coming by, Rachel. Well, my love for the tower blocks is nothing more than a romantic notion, really. I know the reality can be much more bleak. I lived in one for a few weeks in Sofia and loved the outlook – but remember the terrible noise the flushing system made! Oh, and there were hardly any lights which was a serious test for me. well, I have no problem with romantic notions – they make living in a city a lot more bearable and the thought of living in the country idyllic!